FORMER Richmond half-forward Ben Lennon will head to the US in 2019 with dreams of an NFL career after earning a punting scholarship at the University of Utah. Lennon, who was delisted by the Tigers at the end of 2017, will join former teammate Ben Griffiths in the US college system after 12 months of specialised training in Australia. The news was confirmed by Prokick Australia, which had been helping Lennon make the transition to American football since his departure from the Tigers. Lennon will train in Australia alongside Griffiths for the next 12 months while completing a Bachelor of Education before moving to Utah at the start of 2019. Griffiths announced his retirement this week to take up a 2019 scholarship with the University of South California, but will also need to study full-time in 2018 to make the transition. 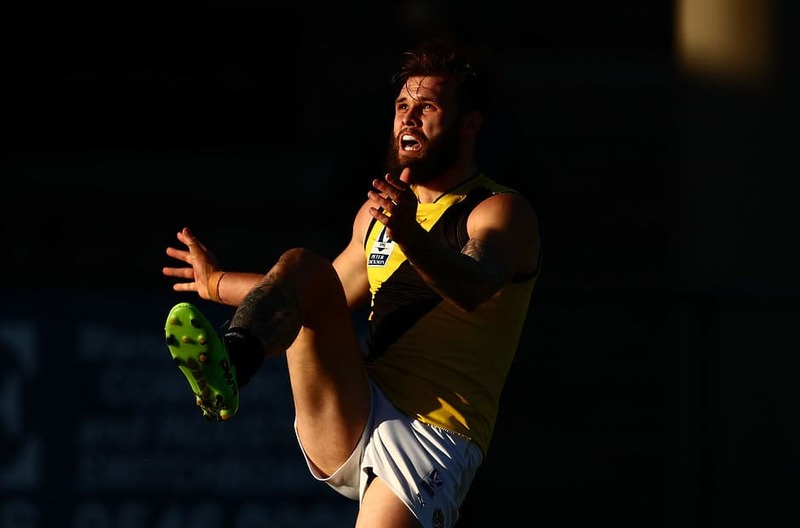 Lennon was delisted by the Tigers after four seasons and left the game with a sour taste in his mouth, but the 22-year-old was excited by the possibility of a new professional sporting career. "With the way my AFL career panned out, it's really cool to have something else to be excited about and I'm looking forward to getting over there in 2019 and showing what I can do," Lennon told AFL.com.au. "Playing Australian football, I felt like my kicking was my biggest strength, so I'm hoping that can transfer across. "There's a lot of hard work to do, but I'm grateful I've got this year to try and perfect it as much as I can and hopefully that will hold me in good stead. "I definitely would like to play in the NFL. It's obviously one of the biggest sports in the world, if not the biggest … but if things don't work out at least I can walk away from doing this with a degree under my belt." After deciding not to pursue another AFL chance as a recycled player, Lennon said he would likely have overlooked VFL opportunities to play local football in 2018 if the college scholarship had not presented. "I had a sour taste in my mouth from AFL and how things panned out … and that's when I thought maybe my dream's finished with AFL," he said. "But at the same time I still had the buzz to pursue something, I just didn't know what." Lennon will be the third consecutive Australian to punt for the Utes, following in the footsteps of successful Prokick products Tom Hackett and Mitch Wishnowsky. Former Hawthorn and Brisbane player Nathan Chapman, who runs Prokick Australia, said Lennon had long been in the sights of Utah before his scholarship was confirmed on Sunday morning. "He's got the leg strength to be able to go to the next level," Chapman said. "We chose him because of the skillset he brings and the expectations are high for him to follow on the legacy of Utah having one of the best special teams units in the country." Lennon and Griffiths have both accepted scholarships at US colleges that have punters in place for the upcoming 2018 season, delaying their starts by 12 months. Former St Kilda player Arryn Siposs has joined Auburn University for the 2018 season and will fly out in July, while former Fremantle player Max Duffy left on Sunday to join the University of Kentucky. Chapman, who signed an NFL contract with the Green Bay Packers in 2004, said US college coaches were now approaching Prokick Australia more than a season in advance to secure punters.